60x60 is a project containing 60 works each 60 seconds in length presented continuously in an hour performance synchronized with an analog clock. 60x60 presents a slice of what is happening in the contemporary music scene by representing 60 works that are diverse in aesthetic and style. 60x60 places a call for works every year and picks (at least) 60 composer's audio works to drive the performance season that year. The 60x60 mix is then used as a base for other 60x60 projects and collaborations. "Either a genius or crazy concept for a dance show, depending on how you look at it: 60 choreographers each create 60 seconds of movement to be performed in succession, making one hour of fast-changing, switched up dance ... dance styles range from ballet to Lindy hop to street, jazz and contemporary, and if there's one thing you can say for sure, it won't be boring." 60x60 Dance takes each minute from a 60x60 mix and pairs it to a choreographer to create a one-minute dance. This one-of-a-kind performance, where each minute of the hour features a new composer and a new choreographer. The 60x60 Dance collaboration is one of the most loved performances of 60x60 and has been performed in more than 7 different cities in 3 different countries. 60x60 Dance has featured more than 500 choreographers and thousands of dancers. Each performance run features a different group of composers and choreographers. The performance pairs 60 modern dances with 60 contemporay music works to be performed in sequence without pause to create an hour of pure inspiration. 60x60 Video has collaborated with video artists, experimental filmmakers, and VJ's to pair the 60 different audio compositions with video. The unique format of 60x60 video has led to many performances in interesting places where contemporary music is seldom found. 60x60 Video has been viewed in several bars and nightclubs through out the world: 60x60's first visual collaboration with the notorious experimental filmmaker Nick Zedd was screened in New York City's nightclub "The Lobby"; Shimpei Takeda's collaboration with 60x60 was seen in "Lucky Cat" a bar in Brooklyn, New York; and Toronto's nightclub, the "Supermarket," screened one of Patrick Liddell's collaboration of the 60x60 mixes. The video collaboration of 60x60 has also been presented in dynamic ways where contemporary music is almost never presented. The 60x60 Radio Request Extravaganza is a tour de force for new music and radio. It is a smorgesborg of new music where just about anything goes... all you need to do is request it. The 60x60 Radio Request Extravaganza was designed with the most democratic of visions. If a composer/soundartist submitted a work, it could be requested for broadcast on the Radio Request Extravaganza. The radio program is a fast paced, action packed barrage of of new music minutes instigated by requests from fans located around the world. Among the hundreds of works broadcasted the program usually hosts several 60x60 guests to interview and explain the project and its mission. 60x60 Images is a 60x60 multimedia collaboration based on fine art works that are 60 centimeters in length and 60 centimeters in width and then paired with a 60 second audio work in an art installation or performance. the project first started in Teatro Nuovo Giovanni in Udine, Italy with an idea by Vittorio Vella, and Francesca Agostinelli and Taukay Edizioni Musicali. 60x60 Images was also presented in conjunction with the opening of the 24th Annual Minumental Show Art Academy of Cincinnati. 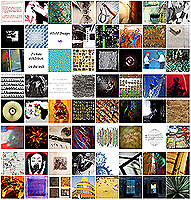 60x60 Images is the counterpart for visual artists. Moving from the temporal nature of music to the metric scale, each artwork is created to measure 60x60 centimeters. Forty were selected from a call for works which required a difficult selection to be made from 221 works coming from 26 countries around the globe. Twenty additional artists were invited to participate in 60x60 Images in part because they have already participated in the festival. In addition, they were invited because they are artists selected for their regional profiles in the contemporary art scene. 60x60 Images uses the audio from the 60x60 Crimson Mix. 60x60 Orchestra Project is to orchestra what 60x60 is to speakers. 60x60 is a project containing 60 works each 60 seconds in length presented continuously in an hour performance synchronized with an analog clock. The 60x60 mission is to present an audible slice of what is happening in the contemporary music scene by representing 60 works that are diverse in aesthetic and style. Since 2003, the music of more than 2000 contemporary composers has been featured on the Electroacoustic 60x60 project. Thousands of audience members from Berlin to Chicago to New York City to Los Angeles and points in between have experienced this innovative program which synchronizes a clock with 60 one-minute electroacoustic compositions. The 60x60 Orchestra Project brings this innovative listening experience into symphony concert halls.